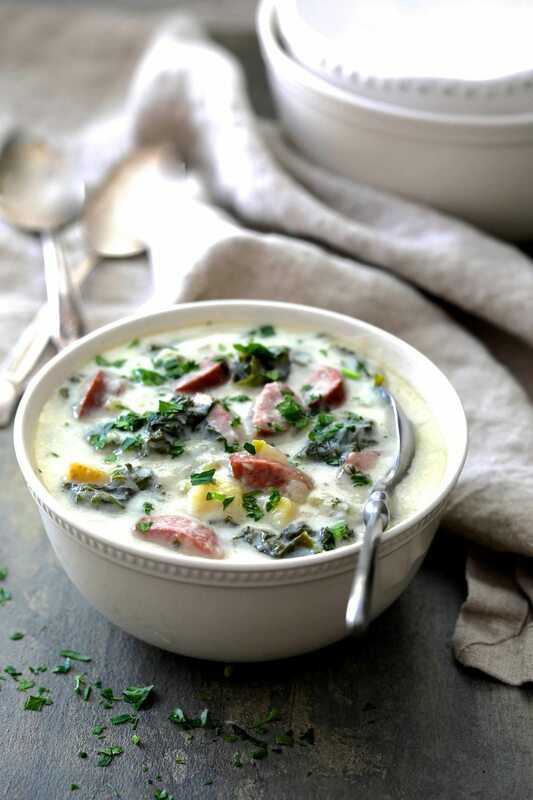 Creamy Potato Kielbasa and Kale Soup is complete comfort in a bowl that's perfect when the weather gets chilly! Heat canola oil in a Dutch oven over medium-high heat. Add the onion and celery, reduce heat to medium-low and cook 8 - 10 minutes or until vegetables are tender. Add the garlic and the potatoes and stir. Add the chicken broth and kielbasa. Bring to a boil, reduce heat to medium-low and simmer 10 - 12 minutes or until potatoes are tender. Add the kale and cook 1 - 2 minutes more. Turn off the heat, cover and set aside. Melt butter in a saucepan over medium-high heat. Add the flour and cook 1 - 2 minutes, stirring constantly. Add half and half, whisking constantly. Whisk in a ladle-full of the chicken broth from the Dutch oven to prevent it from becoming too thick to work with. Transfer the thickened combination to the Dutch oven. Bring the soup back up to a simmer and cook over low heat until thickened. Stir in Dijon mustard and Worcestershire. Season to taste with salt and black pepper and serve.